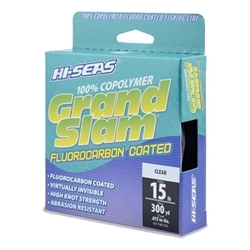 Hi-Seas Grand Slam Fluorocarbon Coated fishing line is an extra strong, 100% copolymer with a fluorocarbon outer coating. This line is virtually invisible and can be used in any water conditions. It is a top choice when visibility is a concern, such as fishing in clear shallow waters or in top water. Made from the highest quality copolymer, Grand Slam Fluorocarbon Coated is extremely supple and easy to cast using bait casting and spinning reels. The line is manageable, easy to knot and delivers high knot strength.